I was simulating on a translucent material based on Radiance BRTDfunc material primitive. And the model I used was from CIE test case (CIE 171:2006), a simple 4m×4m×3m box with a roof opening of 1m×1m in the middle. 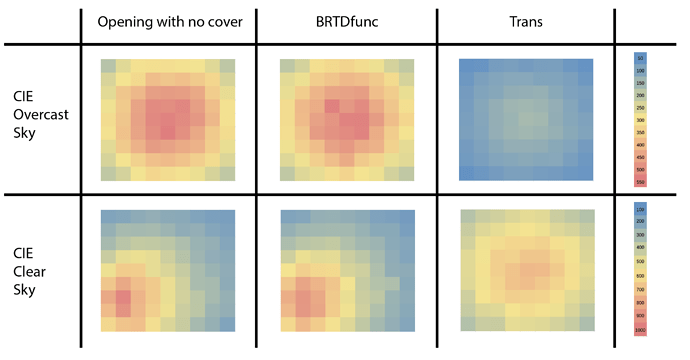 But I found the results confusing because the BRTDfunc result was almost the same as that of an opening without any cover, as illustrated in the following picture. I also used a Trans material primitive to compare with BRTDfunc, and it seemed more correct. And now I don’t know what the problem is. Maybe it’s the way I using BRTDfunc that goes wrong. Can you kindly help me out with this issue and give some advice? Thank you in advance! I suspect there may be something else wrong with your model. Did you use the exact same skylight geometry in both cases? When I compare these materials as you’ve given them, they look very nearly identical in my renderings. I can only see slight differences in color. Perhaps if you uploaded the rest of your model and your calculation parameters, we can figure out where things are going wrong. Thanks for your quick reply Greg! Well I think I have found where the problem is but I need your support for evidence. I’m using Radiance through DIVA. Since I used the symbol “&” for naming the material, and after running the command obj2rad, I found no information about BRTDfunc in the converted .rad file. But when I changed the name to “Sample4_BRTDf” with “&” deleted, there came the information of BRTDfunc in the .rad file. And the result turned out pretty nice. So I was wondering if it’s a bug of DIVA (or even Radiance but in my opinion less possibly). I checked, and it seems that obj2rad does not care any more than the rest of Radiance if a material name has an ampersand (’&’) in it. However, if this information gets passed carelessly through XML or any related file format, it would likely cause problems, so your surmise of the issue is probably correct. I do not know enough about DIVA to speculate further. may use any of the above characters by default!